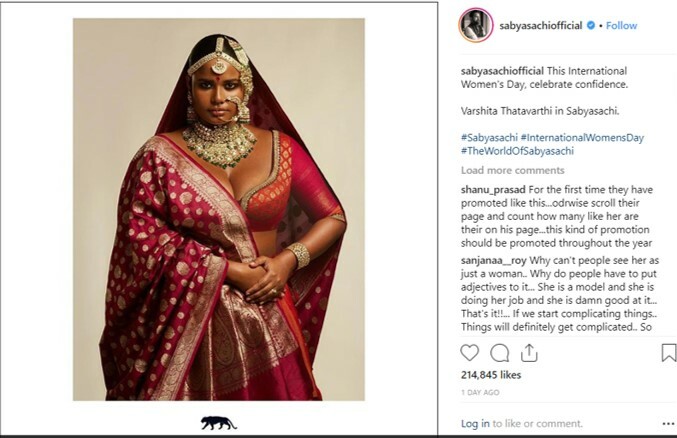 What’s wrong with Sabyasachi’s Women’s Day Ad? Yesterday, as they do every year, a spate of brands paid tribute to women on the occasion of International Women’s Day. Most brands do not expect any appreciation or acknowledgement for doing this – it’s become a form of tokenism to have a Woman’s Day ad, or a special offer for women. But brands also do not expect to be trolled or mocked for doing it. Amongst the many brands celebrating Women’s Day, was Sabyasachi Mukherjee, perhaps the most influential designer that India has produced. He put out a Women's Day Campaign , which at first glance, is politically correct enough. Featuring a gorgeous, dusky, curvy model in a beautiful creation, the ad is titled “This International Woman’s Day, celebrate confidence.” You would think, nothing to take offence to in that, right? Add to this, the fact that Sabyasachi is one of the most loved, most aspirational brands for the fashion-forward Indian woman. ‘To be married in a Sabyasachi’ is a dream for many young people, even if they cannot afford one of his creations. The reactions are not misplaced. A glance at the designer’s Instagram feed shows that a majority of his models are slim/skinny - not different from any mainstream fashion brand or designer label. The reaction to this campaign, highlights beautifully and succinctly, why a conventional advertising approach is failing in the digital era, and why brands that bring this approach are struggling despite desiring and trying to connect with their audience. The digital era is all about consistent, rather than convenient and opportunistic dialogues with audiences. Earlier, brands would open conversations when they had something to sell or offer. Today, business owners, CEOs, bloggers and regular people talk daily about what matters to them and put it out to the world. In this 24X7 world, where the lights are always on, it’s easy to know what someone has stood for, and what they are all about. All you need to do, is search out their posts from the past. Journalists do it, and so does everyone else with access to Google, or any social media platform. Hence, this era also comes with a built in BS detector for most audiences. Paradoxically, at at time when manipulation and trickery are at a peak, young people passionately search for, and express, their own authenticity and truth. We desperately need to see and hear examples of being imperfectly, yet honestly real to be reassured that we too can survive and thrive in an increasingly false and cynical world. And people seek this in the online world. They seek out people who talk good, do good and mean what they say. It is not surprising that people would call out Sabya for a one-day lip service to inclusive beauty, when designers and brands like Ayush Kejriwal and Huda Beauty have been quietly and consistently doing this for a long time. A demonstration of belief is not an ad, or even a campaign but a sustained stance of a brand over time. It’s not just about walking the talk, but walking with people – in the long run. It’s what makes you credible and authentic. Something that Gillette also learned the hard way with their ‘toxic masculinity’ ad. Nothing was wrong with the stance, everything was wrong with jumping late into a meaningful conversation that people were already having around the world. And being sanctimonious about it. Probably Sabyasachi and his digital agency need to introspect on how they can join the movement with humility instead of ‘taking a stand’. People, a community around the world, have already taken a stand. You can be part of it. You cannot make a belated entry and then claim to own it. Possibly the worst entry you can make into the arena is with a conventional ad approach that talks at people, vs talking with them. In my opinion, this is the mistake made by both Gillette and Sabyasachi. Whether you release your ad on YouTube or a post on Instagram, conventional advertising is predicated on talking at people who are nameless, faceless masses on the other side of the screen. But in the digital world, there are real people who respond and react to others. Even stars are reacting as real people (and they might even reply to you). No one is talking ‘at’ someone else. The areas of beauty, femininity and fashion have been felt the maximum impact of the quest for more truthfulness and inclusiveness. Traditionally, these industries have been about hierarchy, exclusion, rigidly defined prescriptions of the beauty ideal, and objectification of women to meet male desire. For decades, the self worth of women has been at the ransom of these powerful industries that tell us how to look good, how to be attractive, what to wear, what we need to do to be admired and get social approval. The shift came with the digital era when real women began to interact with real women from around the world and exchange views (vs reading media and brand led views). Some of these women were so inspired and inspirational, that they became influencers to other women. They put out poems, blogs, visuals, and some like Huda Kattan, built brands around the beliefs that they passionately espoused. Then come the mainstream beauty and fashion brands imbued with a desire to enter into this conversation and connect with this audience. One must understand the deep political sensitivity of engaging on topics of beauty. Let’s take the issue that enraged Sabyasachi fans. Plus-sized women are a reality in society and absent in fashion. For years, women have been sold the idea that to be part of the fashionable world, you need to be slim. They feel left out when they cannot wear the skimpy, slinky garments with plunging necklines favored by skinnier peers. They cover themselves up. They welcome the conversation in social media that increasingly focuses on inclusion, realistic beauty, non-photoshopped models. Women need to believe that the new reality is inclusive beauty. They love to read messages of acceptance and support from other women like them, from influencers, from celebrities like Serena Williams. But when a plus sized woman looks into the mirror, does she really feel beautiful? Or does she think of the many times that she or other women like her have been fat shamed? Does the fact that a brand is telling her she is beautiful, make her feel so? Can it overcome the years of social conditioning to believe otherwise? This is where political correctness steps in with a vengeance. Many brands think that it is politically correct to be inclusive. Well, understand that in the online world, political correctness about beauty no longer works. People see through it. The very perpetrator of the reality, is seeking to deflect it. When a Nike makes an ad telling women to Dream Crazier, they are backed by sports celebrities who did that. But when you are a fashion or beauty brand, who has advertised for years with slim and beautiful stars, how can you claim to endorse curves? Will you sign only plus sized models in the future? Will you design specially to make curvaceous women look gorgeous? Will you alter your design aesthetic? Will you make statements in the press to this effect? This is where the much touted term ‘brand purpose’ makes an appearance. Brand purpose is much more than a higher order ideal that you can subscribe to once a year. Few people really know their purpose in life. And even fewer brands do. It’s at least honest to say that you have no purpose and you exist to make money. But if you aspire to have a purpose, then beware. Beware lest it makes you self righteous and blind to the fact that you are no messiah for the masses, you are reflecting a trend and not creating it. Beware, if you think that an annual (or bi-annual) campaign is enough to make the world believe that you are armed with purpose. People can go through your entire history of communication in a few swipes and clicks, and will call you out on your inconsistencies. And finally – the bigger a brand you are, the more you will be held accountable. Remember what happens to celebrities. They get trolled the most for shooting their mouths off. So too, do brands. We live in an age when it’s easier than ever to make money or be famous. But it’s extremely hard to find a moral high ground on anything. Everyone is under scrutiny all the time, and a slip is generally fatal. Hopefully lessons that Sabyasachi and other brands will learn, in the years to come. I am an ardent follower of Horace Dideu's Asymco blog, where he discusses interesting and geeky statistics pertaining to Apple and iOS. He reported that Apple has overtaken Rolex sometime ago to become the world's largest watchmaker - both in revenue and in unit sales. Incidentally, Rolex sells about a million watches a year. 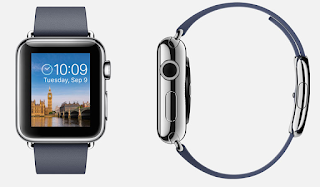 However, Apple has become market leader in the short span of just two and a half years since entering the watch market - a market for a product which is not even it's primary offering. Rolex has been in the business of watches for more than a 100 years. "Well, in our country," said Alice, still panting a little, "you'd generally get to somewhere else—if you run very fast for a long time, as we've been doing." You no longer have a lifetime to build a market leading brand. Nor can you justify that you need time to 'get it right'. Whether it's the point at which a business turns from red to black, or whether it's hitting a sales target, we give ourselves less time for success these days. One of the reasons, is because we have so much more data to inform decisions, or make midway course corrections. Uber has never operated a cab of their own. AirBnB was never in real estate. And Apple is not a watchmaker by heritage. Swiggy is not a restaurant expert. It just takes an idea, perfect execution and impeccable timing. And of course, getting all this right in a short time. It's not easy. But it has been demonstrated time and again, by a handful of companies, that it's possible. It was fascinating to read this article in Tech Radar about the prosthetics of the future, some of them fitted with microprocessors and sensors, which both look and act futuristic. But what interested me the most, was to learn that until recently, designers in prosthetics companies never really spoke to consumers. Of course, they did testing - of both prototypes and final products - but they never set out to understand how amputees feel about their condition. How they feel about wearing a device, what other people say about it (or how they look at it) and the impact on their self confidence. This is a common problem, in the medical space - with companies that manufacture devices, and those that make medicines. They are problem centric, not consumer centric. They see themselves as providing a solution to a problem, rather than doing something for a consumer or end user. When the prosthetics companies did finally start speaking to consumers, they understood that their job was not just to replace a lost limb. It was to erase the stigma of being lesser than other people. It was to change the dialogue from 'Oh I am so sorry, what happened to you? to "Wow, what are you wearing?" 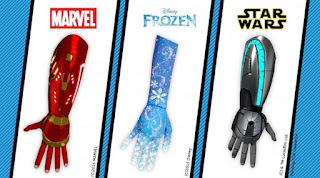 It led to the design of hero-inspired prosthetic (Iron Man, Star Wars) could light up or make noises. They did not even cost a bomb, like some of the more sophisticated prosthetics. They simply looked cool. Kids loved them. It elevated them from 'lesser' kids to superheros in their own eyes, and in their friends eyes. 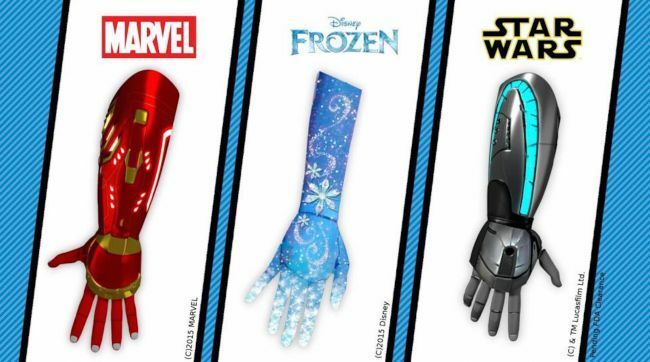 One day, it might be cooler to have a prosthetic than a real limb. But we would have never, ever gotten there, without Human Centered Design. Local news never ceased to be important to us. We hear it from our maids, and security guards. We seek it out on Twitter and in WhatsApp Groups. But unfortunately 'news' is too often serious, political, increasingly opinionated and it's becoming a pain to watch or listen to it. And despite a real need, there is just not enough local news, except for a few channels on Twitter. She is having fun, she is not bound by journalistic rules and agendas. And I am sure her locality is tickled by her. In the era of Facebook Live, Instagram and much more, can we have more citizen journalists (even young ones) with a zen to cover the local news including rescued cats and more? SAP has been in the news for wrong reasons in the past year. The German ERP software giant engaged in a litigation with Diageo UK for violating SAP's indirect licensing rules by integrating SAP with software from Salesforce. The judge found Diageo guilty of violation, through the company had already paid SAP more than 54 Million GBP in licensing fees. Licensing is a horrendously complex subject. Ask Microsoft. Ask Adobe. Ask Oracle. They would all have stories to tell about the difficulty of communicating licensing to customers. So are many of the technical, legal or price-related conversations that B2B companies need to have with their buyers. Especially in the new age of cloud, big data integration and multi-device access. It is crucially important to strip away the legal jargon and communicate with complete clarity. The benchmark for describing your terms and conditions should be 'Is it easy enough for a layperson to understand?' If not, you need to work on simplifying it. In fact, the clauses that are most likely to be ignored or misunderstood, should be highlighted and given extra importance. Banks really do need to bring in more honesty in communication. With respect to account charges and credit card charges. The age of hiding behind small print and legalese is over. Conversations on money should never, ever have ambiguity. It's true in case of the smallest deals, and the biggest corporations. Therefore, it is surprising that SAP has allowed ambiguity to exist. The repercussions are painfully clear in this case. Reduced customer confidence. Lack of trust towards the company that they pay millions of dollars to already. And ultimately, an erosion of the brand equity that the organisation has built over years. One hopes that they can come out of it. But meanwhile, others can look at the situation, and learn their lessons. Yesterday, I visited the St-art India Festival (Street Art) housed at Sassoon Docks, Mumbai. Those of you who have visited Sassoon Docks, a 142-year old fish market, will know that the first and most inescapable impression is the strong, overpowering smell of fresh and dried fish, impossible even for fish lovers to tolerate for long. 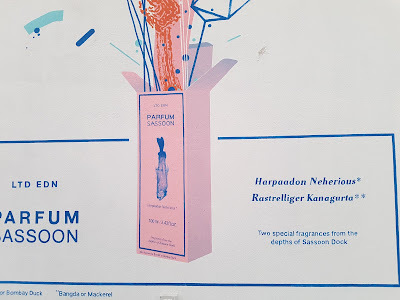 The artist even had giveaway empty cartons of perfume, that you could take back with you. He reminded me that the smell of Mumbai is an inescapable part of the city, like its skyline. In its extreme form, I notice it, but otherwise I am used to the smell of Mumbai, which an outsider will immediately notice when it hits their nostrils. It was a reminder of the power of smells and their associations. 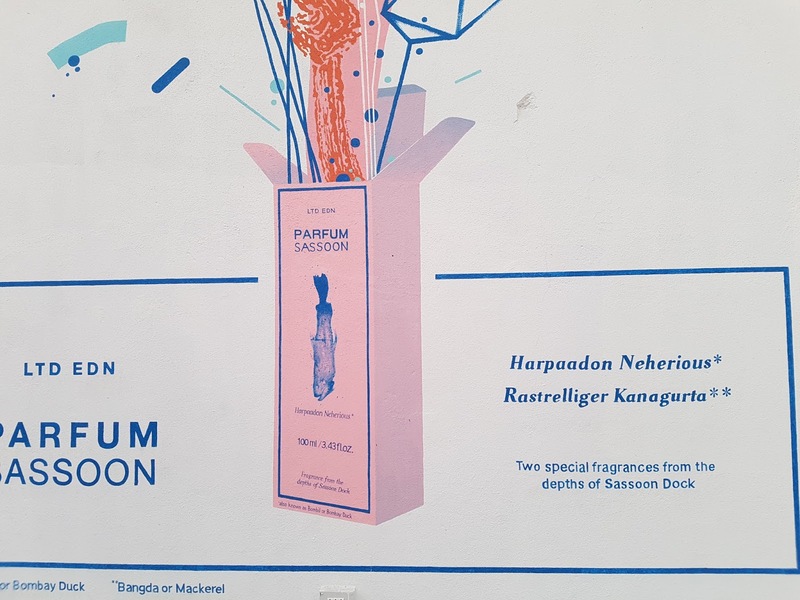 It could have been a fun, funky installation for a young perfume or deo brand. Provided they CREATED and did not SPONSOR it (an important distinction). All around me, I saw very young, very hip youngsters, engaged not in the art exhibits but in youngster's favorite activity these days - selfie taking, with art exhibits as the backdrop. It's not the first time that I have seen this. 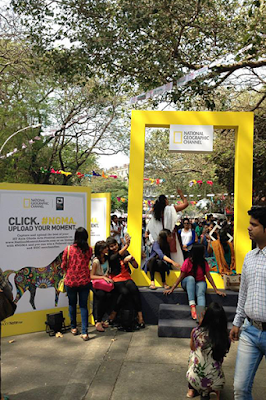 This Nat Geo installation at Kala Ghoda a few years ago was a selfie hotspot for youngsters. Thus the reach was not limited to just visitors - the brand logo went viral on social media - and amongst just the young TG the brand sought to reach. By calibrating the selfie (or photo op) smartly, you can reach an older audience as well. It got me thinking as to why more brands do not use public art as a way to engage with audiences. At places like Metro Stations, parks, college campuses, bus stops, even roadsides. 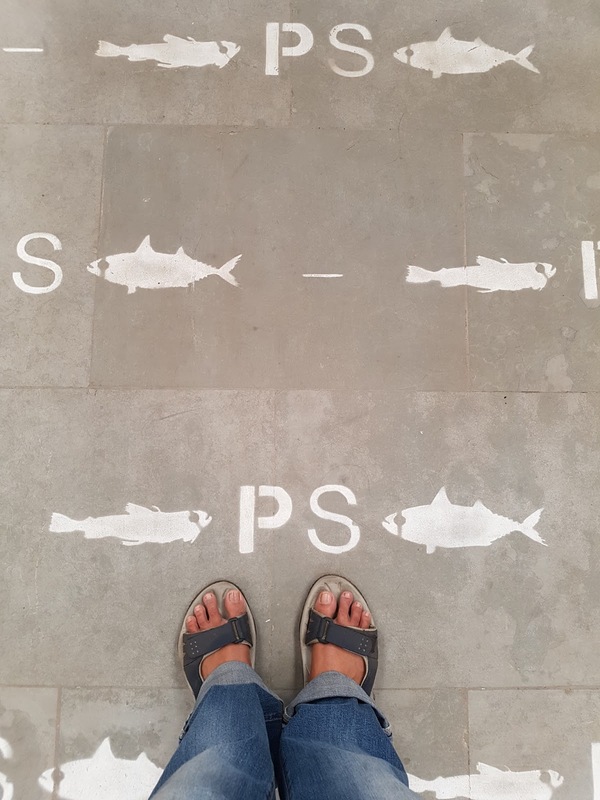 At places where people wait, where they queue up. At places where they chill out. Why do we fall back on the old mediums of hoardings, televisions, walls to plaster brand advertising? Why not create a fresh installation? It's naturally more buzzworthy than a lot of online content because people can physically engage with it. It benefits artists not only financially but also giving them a showcase for their work. Our civic bodies do not prioritise beautification and brand funding can definitely raise the character of our public spaces. And finally, public art can make people happy. It can be a mood changer in our daily, grimy, sweaty lives. Of course, it's not as easy as it sounds which is why more brands are not doing it. You can't just shove a brand message into a public space. It needs to be subtly done. There needs to be empathy with the context, the ethos of the city and its people. That's what tugs at the heart. 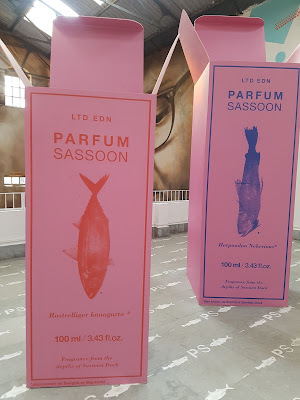 Kulavoor's perfume exhibit did that for me. It integrated the city and a love for it, with a creative (almost ad agency creative) touch. And it worked. Lastly, do remember, one of the most important social services you are performing, is offering people cool photo ops and selfie backdrops. Seems we just cannot have enough of them. I mean, look at the number of selfie takers who have lost their lives trying to pose on the seaside and on cliffs. We really need safe spaces to cater to this selfie hunger and I am only half joking here. Seems like a win-win situation for all.